Bakers throughout Colorado have mastered the art of making one of America’s most beloved desserts—apple pie. A flaky crust, a passel of fresh apples, and a lot of love are the secrets that are sure to put a pie-eating grin on your face. Here are the best shops for delicious apple pie in the state! If you have a hankering for pie, you’ll find a smorgasbord of options here, more than 25 different types of pies of all flavors. Apple tops the list as a favorite. Get it straight up, or as a Dutch apple, as well as gluten free or sugar free. The caramel apple is award-winning, placing first in the National Pie Championships and the Boulder Pie Festival. Two rolling pins and the four arms of the two bakers who run this shop are the secrets behind the amazing pies here. Plus, all ingredients are brought in fresh weekly. Purists will love the Apple of My Pi, an ol’ fashioned sweet and tart pie. Be sure to add a scoop of vanilla bean ice cream of slice of Dubliner cheese. The Wicked Southern Dutchman is a Dutch Apple enhanced with Kentucky Bourbon. Grab one of the Sweet Pi’s on The Fly for a take-home treat. Love on a plate. Isn’t that what mom’s cooking is all about? The pies here personify the home-made goodness that moms are known for. Recipes have been handed down through four generations of women pie makers. Each pie is rolled out by hand and heaped with the freshest ingredients. 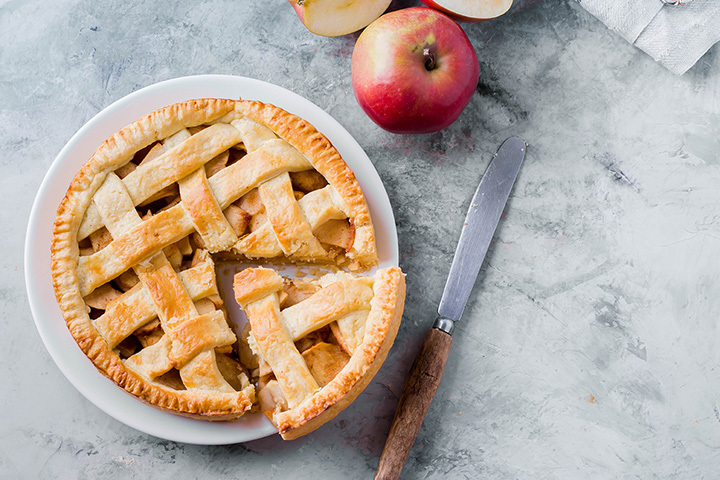 The apple pie is straightforward, with a little bit of sassiness thanks to tart apples. Get it gluten or sugar free. Pies available in three, six and nine-inch sizes. “Oh me, oh my, love that country pie,” sang Bob Dylan about this simple comfort food that’s so quintessentially American. The apple pie made here is traditional—a flaky, buttery pie crust filled with tart, crunchy apples dusted with a little bit of cinnamon and nutmeg. Buy it by the slice, with a dollop of ice cream, or grab a whole pie and bring a little comfort home. When is an Airstream trailer not about being a mobile home? When it’s a traveling pie shop. The owner of this dessert domicile, on any given day, can be found somewhere between Boulder and Denver, pushing her delectable pies that are baked in cast-iron pans from recipes fine-tuned by generations of her Midwestern family. Two standout pies: Too Piglet to Quit with apple, Brie and prosciutto, or a spiced cranberry apple just like her grandma taught her to make. W.G.B.P. Translated, “would Grandma be proud” is the motto this store lives by. That and “when you need pie,” you need to go here. You just can’t go wrong picking up a slice or a whole award-winning pie. All made-from-scratch fruit pies come with either a crumb, pastry or lattice pastry top. Apple choices include traditional plus apple with blackberry, blueberry, cherry, ginger peach, raspberry, strawberry and a caramel apple pecan. A family of bakers have made this a pie haven. You will feel humbled by the mouthwatering lusciousness of these from-scratch, handmade pies. They’re famous for their Pie-Shake, a piece of your favorite pie blended with ice cream. If you love apple, choices include Dutch caramel, salted caramel with a crumb topping and one paired with blackberry. Pies come in mini or medium-sized, by the slice or whole. Whoopie, there are pies here. Whoopie pies, of course, but also sweet, tart, crunchy apple pies in a flaky, buttery crust. The apple cranberry is made with 11, not 10 or 12, apples per pie, a mix of Gala, Pink Lady and Granny Smith. It’s dotted with fresh cranberries and topped with a Dutch streusel of almonds and brown sugar. Don’t miss the apple pie milkshake at this pie-shaped bakery. This small-batch bakery makes a handmade apple, cheddar and green chile pie that fits in your hand … aka hand pie. Hands play a huge role at this bakery. Everything is made by hand, dough is hand-shaped and hand-crafted. The all butter pie crust has just the right amount of flakiness. Local, seasonal and organic ingredients are featured. The old-fashioned and Dutch apple pies are served by the slice. Special order a whole one. You’ll find this sweet spot in the local Nature’s Oasis Market, somewhere between the wine annex and the deli. Glance at the pastry case and you’ll see a bevy of hand-crafted, made-from-scratch baked goods. All are made with seasonal, organic and locally-sourced ingredients. That’s why you’ll find apple pie in the case only between Labor Day and December, when apples are in season. The simple delight here is that everything is incredibly fresh.